Lutz Bornmann, Caroline Wagner, & Loet Leydesdorff, The Geography of References in Elite Articles: Which countries contribute to the archives of knowledge. PLOS ONE, 13(3), (2018) e0194805. Jordan Alexander Comins, Stephanie A. Carmack, and Loet Leydesdorff, Patent Citation Specroscopy: Online retrieval of landmark patents based on an algorithmic approach, Journal of Informetrics 12(4) (2018) 1223-1231. Jordan Comins and Loet Leydesdorff, Data-mining the Foundational Patents of Photovoltaic Materials: An application of Patent Citation Spectroscopy. Journal of Scientometrics Research 7(2) (2018) 79-83; doi: 10.5530/jscires.7.2.13. Lutz Bornmann and Loet Leydesdorff, Count highly-cited papers instead of papers with h citationsâ€”Use normalized citation counts and compare â€œlike with â€œlikeâ€�! Scientometrics 115 (2018) 1119-1123; https://doi.org/10.1007/s11192-018-2682-1. Loet Leydesdorff and Adina Nerghes, Co-word Maps and Topic Modeling: A Comparison Using Small and Medium-Sized Corpora (n < 1000), Journal of the Association for Information Science and Technology 68(4) (2917) 1024-1035; doi: 10.1002/asi.23740. Xiaojun Hu, Loet Leydesdorff, and Ronald Rousseau, Network heterogeneity in an undirected network: Definition and measurement, Journal of Informetrics 11(2) (2017) 669-682; doi:10.1016/j.joi.2017.05.003. Inga A. Ivanova, Ã˜ivind Strand, Duncan Kushnir, and Loet Leydesdorff, Economic and Technological Complexity: A Model Study of Indicators of Knowledge-based Innovation Systems, Technological Forecasting and Social Change 120 (July 2017) 77-89; doi: 10.1016/j.techfore.2017.04.007. Ã˜ivind Strand, Inga Ivanova, and Loet Leydesdorff, Decomposing the Triple-Helix Synergy into the Regional Innovation Systems of Norway: Firm Data and Patent Networks. Quality & Quantity 51(3) 963-988; doi:10.1007/s11135-016-0344-z. Sally Wyatt, StaÅ¡a Milojevič, Han Woo Park, and Loet Leydesdorff, Quantitative and Qualitative STS: The Intellectual and Practical Contributions of Scientometrics. Pp. 87-112 in: Ulrike Felt, Rayvon FouchÃ©, Clark Miller, and Laurel Smith-Doerr (Eds. ), Handbook of Science and Technology Studies (4th edition). Boston, MA: MIT Press, 2017. Loet Leydesdorff, The positive side of discursive disagreements in the social sciences, Journal of Informetrics 11(4) (2017) 1043; https://doi.org/10.1016/j.joi.2017.09.006. Krassimir Markov, Christophe Menant, Stanley N Salthe, Yixin Zhong, Karl Javorszky, Alex Hankey, Loet Leydesdorff, Guy A Hoelzer, Jose Javier Blanco Rivero, Robert K. Logan, Sungchul Ji, Mark Johnson, David Kirkland, & Gordana Dodig-Crnkovic, Data versus Information, International Jouranl of Information Theories and Applications (IJTA), 24(4), 2017, 303-321. Loet Leydesdorff, Paul Wouters, and Lutz Bornmann, Professional and Citizen Bibliometrics: Complementarities and ambivalences in the development and use of indicators, Scientometrics 109(3) (2016) 2129-2150; doi: 10.1007/s11192-016-2150-8. Information, Meaning, and Intellectual Organization in Networks of Inter-Human Communication, pp. 280-303 in: Cassidy R. Sugimoto (Ed. ), Theories of Informetrics and Scholarly Communication: A Festschrift in Honor of Blaise Cronin, Berlin/Boston MA; De Gruyter, 2016. 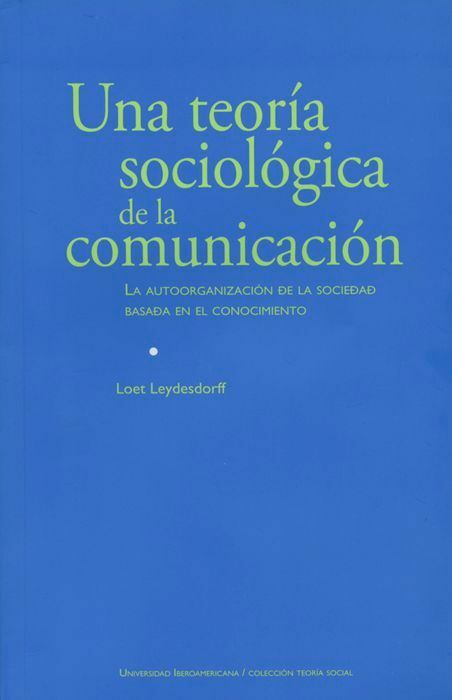 Una TeorÃ­a SociolÃ³gica de la ComunicaciÃ³n, edited and translated by Gabriel VÃ©lez Cuartas, Liliana Ramirez Ruiz, Javier Torres Nafarrate, et al. MÃ©xico: Universidad Iberoamerica (ISBN 978-607-417-343-7). Die Mathematik und andere Kurzsprachen, [The Code of Mathematics: John von Neumannâ€™s The Computer and the Brain (1958)] pp. 253-262 in Dirk Baecker (Ed. ), SchlÃ¼sselwerke der Systemtheorie [Key Works of Systems Theory]. 2nd electronic edition. Springer Verlag, 2016. Leydesdorff, L., Bornmann, L., Comins, J. A., Marx, W., & Thor, A. (2016). Referenced Publication Year Spectrography (RPYS) and Algorithmic Historiography: A Bibliometric Reconstruction of AndrÃ¡s Schubertâ€™s Å’uvre. Pp. 79-96 in W. GlÃ¤nzel & B. Schlemmer (Eds. ), AndrÃ¡s Schubert--A World of Models and Metrics. Louvain: ISSI. Loet Leydesdorff, FÃ©lix de Moya-AnegÃ³n, and Wouter de Nooy, Aggregated journal-journal citation relations in Scopus and Web-of-Science matched and compared in terms of networks, maps, and interactive overlays, Journal of the Association of Information Science and Technology 67(9) (2016) 2194-2211; doi: 10.1002/asi.23372. Loet Leydesdorff, Henry Etzkowitz, and Duncan Kushnir, Globalization and Growth of U.S. University Patenting (2009-2014), Industry and Higher Education 30(4) (2016) 257-266; doi:10.1177/0950422216660253. Leydesdorff, L. (2016). The dynamics of journal-journal citation relations: Can â€œhot spotsâ€� in the sciences be mapped? Proceedings of the Association for Information Science and Technology (https://onlinelibrary.wiley.com/doi/full/10.1002/pra2.2015.145052010059 ). Johann Bauer, Loet Leydesdorff, and Lutz Bornmann, Highly-cited papers in Library and Information Science (LIS): Authors, institutions, and network structures, Journal of the Association for Information Science and Technology 67(12), 3095-3100; doi: 10.1002/asi.23568. Helen Lawton Smith and Loet Leydesdorff, The Triple Helix in the Context of Global Change: Dynamics and Challenges, Prometheus 32(4) (2014) 321-336; doi: 10.1080/08109028.2014.972135. Gabriel Velez-Cuartas, Diana Lucio-Arias, and Loet Leydesdorff, Regional and Global Science: Latin American and Caribbean publications in the SciELO Citation Index and the Web of Science. El Profesional de la InformaciÃ³n 25(1) (2016) 35-46. Qiuju ZHOU and Loet Leydesdorff, The Normalization of Occurrence and Co-occurrence Matrices in Bibliometrics using Cosine Similarities and Ochiai Coefficients, Journal of the Association for Information Science and Technology 67(11) (2016), 2805-2811; doi: 10.1002/asi.23603 ). "In debat over citeren te weinig oog voor kwaliteit werk Nijkamp", NRC, 14 mei 2016, p. W11. Can Intellectual Processes in the Sciences Also Be Simulated? The Anticipation and Visualization of Possible Future States, Scientometrics 105(3) (2015) 2197-2214; doi: 10.1007/s11192-015-1630-6 . The Sciences are Discursive Constructs: The Communication Perspective as an Empirical Philosophy of Science. Pp. 553-562 in: Lorenzo Cantoni and James A. Danowski (Eds. ), Communication and Technology, De Gruyter Mouton, 2015; doi:10.1515/9783110271355-032. Loet Leydesdorff, Floortje Alkemade, Gaston Heimeriks, and Rinke Hoekstra, Patents as Instruments for Exploring Innovation Dynamics: Geographic and Technological Perspectives on "Photovoltaic Cells", Scientometrics 102(1) (2015) 629-651; doi: 10.1007/s11192-014-1447-8. Loet Leydesdorff and StaÅ¡a Milojevič, The Citation Impact of German Sociology Journals: Some Problems with the Use of Scientometric Indicators in Journal and Research Evaluations, Soziale Welt 66 (2015), 193-204. Loet Leydesdorff and StaÅ¡a Milojevič, Scientometrics, in: James D. Wright (editors-in-chief), International Encyclopedia of Social and Behavioral Sciences (2nd Edition), Section 8.5: Science and Technology Studies, Subsection 85030. Micheal Lynch (ed. ), Vol. 21, pp. 322-327. Oxford: Elsevier, 2015. Loet Leydesdorff, FÃ©lix de Moya-AnegÃ³n, and Vicente P. Guerrero-Bote, Journal Maps, Interactive Overlays, and the Measurement of Interdisciplinarity on the Basis of Scopus Data (1996-2012) [software], Journal of the Association of Information Science and Technology 66(5) (2015) 1001-1016. Lutz Bornmann and Loet Leydesdorff, Topical connections between institutions within an organisation (institutional co-authorships, direct citation links and co-citations). Scientometrics 102(1) (2015), 455-463; doi: 10.1007/s11192-014-1425-1. Lutz Bornmann and Loet Leydesdorff, Does Quality and Content Matter for Citedness? A comparion with para-textual factors and over time, Journal of Informetrics 9(3) (2015) 414-429. Lutz Bornmann, Caroline S. Wagner, and Loet Leydesdorff, BRICS countries and scientific excellence: A bibliometric analysis of most frequently-cited papers , Journal of the Association for Information Science and Technology 66(7), (2015) 1507-1513. doi: 10.1002/asi.23333. Marcin Kozak, Lutz Bornmann, and Loet Leydesdorff, How have the Eastern European countries of the former Warsaw Pact developed since 1990? A bibliometric study, Scientometrics 102(2) (2015) 1101-1117, doi:10.1007/s11192-014-1439-8. John Mingers and Loet Leydesdorff, Identifying Research Fields within Business and Management: A Journal Cross-Citation Analysis, Journal of the Operational Research Society 66(8), 1370â€“1384. doi: 10.1057/jors.2014.113. Caroline S. Wagner, Han Woo Park, and Loet Leydesdorff, The Continuing Growth of Global Cooperation Networks in Research: A Conundrum for National Governments, PLoS ONE 10(7): e0131816. doi:10.1371/journal.pone.0131816 . Qiuju ZHOU, Fuhai LENG, and Loet Leydesdorff (2015), The reflection of hierarchical cluster analysis of co-occurrence matrices in SPSS. Chinese Journal of Library and Information Science 8(2) (2015) 11-24. Leydesdorff, Loet (2015). The Triple Helix of Knowledge Production, Wealth Generation, and Normative Control: A Neo-evolutionary Model of Innovation Ecosystems. In Albert Ali Salah, Alkım Almıla Akdağ Salah, Cassidy Sugimoto, Umut Al (Eds. ), 15th International Conference of the International Society of Scientometrics and Informetrics (pp. 2-3). Istanbul: BoğaziÃ§i University. Leydesdorff, L., Petersen, A. M., & Ivanova, I. A. (2015). The Generation and Self-organization of Meaning in the Communication of Information and Redundancy. In G. Kaniadakis (Ed. ), 2nd International Electronic Conference on Entropy and Its Applications (ECEA-2); Section: Complex Systems; at http://sciforum.net/conference/77/paper/3264. Lucio-Arias, Diana, Velez-Cuartas, Gabriel, & Leydesdorff, Loet (2015). SciELO Citation Index and Web of Science: Distinctions in the Visibility of Regional Science. In Albert Ali Salah, Alkım Almıla Akdağ Salah, Cassidy Sugimoto, Umut Al (Eds. ), 15th International Conference of the International Society of Scientometrics and Informetrics (pp. 1152-1160). Istanbul: BoğaziÃ§i Universitesi. Ping ZHOU & Leydesdorff, Loet (2015). An International Comparison of the Citation Impact of Chinese Journals with Priority Funding. In Albert Ali Salah, Alkım Almıla Akdağ Salah, Cassidy Sugimoto, Umut Al (Eds. ), 15th International Conference of the International Society of Scientometrics and Informetrics (pp. 160-171). Istanbul: BoğaziÃ§i Universitesi. Niklas Luhmannâ€™s Magnificent Contribution to the Sociological Tradition: The Emergence of the Knowledge-Based Economy as an Order of Expectations, in: Nachtflug der Eule: 150 Stimmen zum Werk von Niklas Luhmann. Gedenkbuch zum 15. Todestag von Niklas Luhmann (8. Dezember 1927 LÃ¼neburg - 6. November 1998 Oerlinghausen), Magdalena Tzaneva (Ed.). Berlin: LiDi Europe Verlagshaus, 2013; Vol.2, pp. 470-484. Science Visualization and Discursive Knowledge; <pdf>, In: Blaise Cronin & Cassidy Sugimoto (Eds. ), Beyond Bibliometrics: Harnessing Multidimensional Indicators of Scholarly Impact (pp. 167-185). Cambridge, MA: MIT Press, 2014. Hyperincursive Cogitata and Incursive Cogitantes: Scholarly Discourse as a Strongly Anticipatory System, International Journal of Computing Anticipatory Systems 28 (2014) 173-186. Loet Leydesdorff, Lutz Bornmann, Werner Marx, and StaÅ¡a Milojevič, Referenced Publication Years Spectroscopy applied to iMetrics: Scientometrics, Journal of Informetrics, and a relevant subset of JASIST , Journal of Informetrics 8(1) (2014) 162-174. Loet Leydesdorff and Robert L. Goldstone, Interdisciplinarity at the Journal and Specialty Level: The changing knowledge bases of the journal Cognitive Science, Journal of the Association for Information Science and Technology 65(1) (2014) 164-177. Loet Leydesdorff, Inga Ivanova, and Mark Johnson, The Communication of Expectations and Individual Understanding: Redundancy as Reduction of Uncertainty, and the Processing of Meaning, Kybernetes 43(9/10) (2014) 1362-1371. Loet Leydesdorff, Gohar Feroz Khan, and Lutz Bornmann, The Generation of Large Networks from Web-of-Science Data, El Profesional de la InformaciÃ³n 22(6) (2014) 589-593. Loet Leydesdorff, Duncan Kushnir, and Ismael Rafols, Interactive Overlay Maps for US Patent (USPTO) Data Based on International Patent Classifications (IPC). Scientometrics 98(3) (2014) 1583-1599; doi: 10.1007/s11192-012-0923-2 . Loet Leydesdorff, Han Woo Park, and Caroline Wagner, International Co-authorship Relations in the Social Science Citation Index: Is Internationalization Leading the Network? Journal of the Association of Information Science and Technology 65(10) 2111-2126. Loet Leydesdorff, Caroline S. Wagner, and Lutz Bornmann, The European Union, China, and the United States in the Top-1% and Top-10% Layers of Most-Frequently-Cited Publications: Competition and Collaborations, Journal of Informetrics 8(3) (2014) 606-617. Jonathan Adams, Karen Gurney, Daniel Hook, and Loet Leydesdorff, International collaboration clusters in Africa, Scientometrics 98(1) (2014) 547-556; doi: 10.1007/s11192-013-1060-2 . Susanne Baumgartner and Loet Leydesdorff, Group-Based Trajectory Modeling of Citations in Scholarly Literature: Dynamic Qualities of "Transient" and "Sticky Knowledge Claims", Journal of the Association for Information Science and Technology 65(4) (2014) 797-811. Lutz Bornmann and Loet Leydesdorff, Scientometrics in a Changing Science Landscape, EMBO Reports 15(12) 1228-1232; doi: 10.15252/embr.201439608. Lutz Bornmann, Loet Leydesdorff, and Jian Wang, How to improve the prediction based on citation impact percentiles for years shortly after the publication date? Journal of Informetrics 8(1) (2014), 175-180. Chaomei Chen & Loet Leydesdorff, Patterns of Connections and Movements in Dual-Map Overlays: A New Method of Publication Portfolio Analysis, Journal of the Association for Information Science and Technology 65(2) (2014) 334-351. Werner Marx, Lutz Bornmann, Andreas Barth, and Loet Leydesdorff, Detecting the historical roots of research fields by reference publication year spectroscopy (RPYS). Journal of the Association for Information Science and Technology 65(4) (2014) 751-764. Fred YE and Loet Leydesdorff, The "Academic Trace" of the Performance Matrix: A mathematical synthesis of the h-index and the Integrated Impact Indicator (I3), Journal of the Association for Information Science and Technology 65(4) (2014) 742-750. Can Inter-human Communications be Modeled as Autopoietic? Open Peer Commentary to: Hugo Urrestarazu, â€œSocial Autopoiesis?â€� Constructivist Foundations 9(2) (2014) 168-170. Lutz Bornmann and Loet Leydesdorff, On the meaningful and non-meaningful use of reference sets in bibliometrics. Letter to the Editor of the Journal of Informetrics 8(1) (2014) 273-275. Li Jie, Bibliometric analysis of Loet Leydesdorff`s publications, blog, 20 March 2014. An Evaluation of Impacts in "Nanoscience & nanotechnology:" Steps towards standards for citation analysis, Scientometrics 94(1) (2013) 35-55; <open access> . Loet Leydesdorff & Tobias Opthof, Citation Analysis using the Medline Database at the Web of Knowledge: Searching "Times Cited" with Medical Subject Headings (MESH), Journal of the American Society for Information Science and Technology 64(5) (2013), 1076-1080. Loet Leydesdorff, Daniele Rotolo, and Wouter de Nooy, Innovation as a Nonlinear Process, the Scientometric Perspective, and the Specification of an "Innovation Opportunities Explorer. ", Technology Analysis and Strategic Management 25(6) (2013) 641-653; http://dx.doi.org/10.1080/09537325.2013.801948 . Loet Leydesdorff & Ã˜ivind Strand, The Swedish System of Innovation: Regional Synergies in a Knowledge-Based Economy, Journal of the American Society for Information Science and Technology 64(9) 1890-1902; DOI: 10.1002/asi.22895. Loet Leydesdorff, Ping Zhou, and Lutz Bornmann, How can Journal Impact Factors be Normalized across Fields of Science? An Assessment in terms of Percentile Ranks and Fractional Counts, Journal of the American Society for Information Science and Technology 64(1) (2013) 96-107. Does the specification of uncertainty hurt the progress of scientometrics? Journal of Informetrics 7(2) (2013) 292-293 [in reply to Schneider, 2012]. The revised SNIP indicator of Elsevier's Scopus, Letter to the Editor of the Journal of Informetrics 7(4) (2013) 859-860. Lutz Bornmann, Loet Leydesdorff, and Jian Wang, Which percentile-based approach should be preferred for calculating normalized citation impact values? An empirical comparison of five approaches including a newly developed one (P100), Journal of Informetrics 7(4) (2013), 933-944. Lutz Bornmann & Loet Leydesdorff, Macro-indicators of citation impacts of six prolific countries: InCites data and the statistical significance of trends, PLoS ONE 8(2) (2013): e56768. ; doi:10.1371/journal.pone.0056768. Lutz Bornmann & Loet Leydesdorff, The validation of (advanced) bibliometric indicators through peer assessments: A comparative study using data from InCites and F1000, Journal of Informetrics 7(2) (2013) 286-291. Lutz Bornmann, Loet Leydesdorff & RÃ¼diger Mutz, The use of percentiles and percentile rank classes in the analysis of bibliometric data: opportunities and limits. Journal of Informetrics 7(1) (2013) 158-165. StaÅ¡a Milojević & Loet Leydesdorff, Information Metrics (iMetrics): A Research Specialty with a Socio-Cognitive Identity? Scientometrics 95(1) (2013) 141-157. Han Woo Park and Loet Leydesdorff, Decomposing Social and Semantic Networks in Emerging â€œBig Dataâ€� Research, Journal of Informetrics 7(3) (2013) 756-766. Bas van Heur, Loet Leydesdorff, and Sally Wyatt, Turning to Ontology in STS? Turning to STS through 'Ontology'. Social Studies of Science 43(3) (2013) 341-362. Erjia Yan, Ying Ding, Blaise Cronin, and Loet Leydesdorff, A birdâ€™s-eye view of scientific trading: Dependency relations among fields of science, Journal of Informetrics 7(2) (2013) 249-264. McCall's Area Transformation versus the Integrated Impact Indicator (I3), Journal of Informetrics 6(4) (2012) 513-514. Loet Leydesdorff and Lutz Bornmann, Percentile Ranks and the Integrated Impact Indicator (I3), Journal of the American Society for Information Science and Technology 63(9) (2012), 1901-1902..
Loet Leydesdorff and Lutz Bornmann, The Integrated Impact Indicator (I3), the top-10% Excellence Indicator, and the use of non-parametric statistics, Research Trends, Issue 29, July 2012. Loet Leydesdorff and Ulrike Felt, Edited Volumes, Monographs, and Book Chapters in the Book Citation Index (BCI) and Science Citation Index (SCI, SoSCI, A&HCI), Journal of Scientometric Research 1(1) (2012) 28-34. Loet Leydesdorff & Tobias Opthof, A Rejoinder on Energy versus Impact Indicators, Scientometrics 90(2) (2012), 745-748; doi: 10.1007/s11192-011-0502-y. Alireza Abbasi, Liaquat Hossain, and Loet Leydesdorff, Betweenness Centrality as a Driver of Preferential Attachment in the Evolution of Research Collaboration Networks, Journal of Informetrics 6(3), (2012) 403-412. Lutz Bornmann and Loet Leydesdorff, Which cities' paper output and citation impact are above expectation in information science? Some improvements of our previous mapping approaches, Journal of Informetrics 6(2) (2012) 336-345. Lutz Bornmann, Felix de Moya-AnegÃ³n, and Loet Leydesdorff, The new excellence indicator in the World Report of the SCImago Institutions Rankings 2011. Journal of Informetrics 6(3) (2012) 333-335. Ki-Seok Kwon, Han Woo Park, Minho So, and Loet Leydesdorff, Has Globalization Strengthened South Koreaâ€™s National Research System? National and International Dynamics of the Triple Helix of Scientific Co-authorship Relationships in South Korea, Scientometrics 90(1) (2012) 163-176; doi: 10.1007/s11192-11011-10512-11199. Gangan Prathap and Loet Leydesdorff, The world of science according to performance indicators based on percentile ranking normalization, Journal of Scientometric Research 1(1) (2012) 53-59. Ismael Rafols, Loet Leydesdorff, Alice O'Hare, Paul Nightingale, & Andy Stirling, How journal rankings can suppress interdisciplinary research. A comparison between innovation studies and business & management, Research Policy 41(7) (2012), 1262-1282. Alkim Almila Akdag Salah & Loet Leydesdorff, The Development of the Journal Environment of Leonardo, Leonardo 45(1) (2012), 88-89. Vlieger, Esther, and Loet Leydesdorff, Visualization and Analysis of Frames in Collections of Messages: Content Analysis and the Measurement of Meaning, in: Manuel Mora, Ovsei Gelman, Annette Steenkamp, and Maresh S. Raisinghani (Eds. ), Research Methodologies, Innovations and Philosophies in Systems Engineering and Information Systems, Hershey PA: Information Science Reference, 2012, pp. 321-339, doi: 10.4018/978-1-4666-0179-6.ch16. Caroline Wagner and Loet Leydesdorff, An Integrated Impact Indicator (I3): A new definition of "impact" with policy relevance, Research Evaluation 21(3), 183-188. Loet Leydesdorff & Ã˜ivind Strand, Triple-Helix Relations and Potential Synergies Among Technologies, Industries, and Regions in Norway, Procedia - Social and Behavioral Sciences 52 (2012) 1-4. De Ontwikkeling van Kennis in Wetenschappelijke Communicatie: Onzekerheid en Codificatie in Anticipatorische Systemen [The development of knowledge in scholarly discourse: Uncertainty and codification in anticipatory systems], Inaugural lecture (in Dutch), June 30, 2011. "Structuration" by Intellectual Organization: The Configuration of Knowledge in Relations among Scientific Texts, Scientometrics 88(2) (2011) 499-520. Bibliometrics/Citation networks, in: George A. Barnett (Ed. ), The Encyclopedia of Social Networks, Sage, 2011, Vol. I, pp. 72-74. Датэрміновае сістэмы і апрацоўкі сэнсу, [Anticipatory Systems and the Processing of Meaning: A Simulation Inspired by Luhmann's Theory of Social Systems. Journal of Artificial Societies and Social Simulation, Vol. 8, No. 2 (2005) Paper 7; translated into Belorussian by Martha Ruszkowski and W.H. Geeks. Este societatea un sistem de auto-organizare? [Is Society a Self-Organizing System? Journal for Social and Evolutionary Systems 16 (1993) 331-349; translated into Rumanian by Alexander Ovsov]. Loet Leydesdorff & Lutz Bornmann, Integrated Impact Indicators (I3) compared with Impact Factors (IFs): An alternative design with policy implications. Journal of the American Society for Information Science and Technology, 62(11) 2133-2146. Loet Leydesdorff, Lutz Bornmann, RÃ¼diger Mutz, and Tobias Opthof, Turning the Tables of Citation Analysis One More Time: Principles for comparing sets of documents, Journal of the American Society for Information Science and Technology 63(7) (2011) 1370-1381. Loet Leydesdorff, BjÃ¶rn Hammarfelt, and Alkim Almila Akdag Salah, The structure of the Arts & Humanities Citation Index: A mapping on the basis of aggregated citations among 1,157 journals Journal of the American Society for Information Science and Technology 62(12) (2011) 2414-2426. Loet Leydesdorff & Tobias Opthof, Scopus' SNIP Indicator: Reply to Moed, Journal of the American Society for Information Science and Technology 62(1) (2011), 214-215. Loet Leydesdorff & Esther Vlieger, Visualizing Meaning: Steps towards Visualization of the Communication of Meaning, SemiotiX XN-5 (2011). Tobias Opthof and Loet Leydesdorff, Citation analysis cannot legitimate the strategic selection of excellence. [A comment to the paper by Waltman et al., Scientometrics, 87, 467-481], Scientometrics 88(3) (2011) 1011-1016. SHI Aolan and Loet Leydesdorff, What do Cited and Citing Environments Reveal about Advances in Atmospheric Physics? Advances in Atmospheric Physics, 28(1), 2011, 238-244. Esther Vlieger & Loet Leydesdorff, Content Analysis and the Measurement of Meaning: The Visualization of Frames of Collections of Messages, The Public Journal of Semiotics 3(1) (2011) 28-50. Zhou, Ping & Loet Leydesdorff, Fractional counting of citations in research evaluation: A cross- and interdisciplinary assessment of the Tsinghua University in Beijing, Journal of Informetrics 5(3) (2011) 360-368..
Book review: Matthias Gross, Ignorance and Surprise: Science, Society, and Ecological Design. Cambridge, MA: MIT Press, 2010; US$ 30; American Journal of Sociology 116(6) (2011) 2022-2024. Book review: Katy BÃ¶rner, Atlas of Science: Visualizing What We Know. Cambridge, MA/ London UK: The MIT Press, 2010; US$ 20; Scientometrics 88(2) (2011) 675-677. Manfred Bonitz and the Matthew Effect: Quantitative Content Analysis of Citation Contexts, ISSI Newsletter Vol. 25-S, March 2011. When can the cross-over between China and the USA be expected using Scopus data? Research Trends, Issue 25, November 2011. Loet Leydesdorff & Tobas Opthof, Scopusâ€™s Source Normalized Impact per Paper (SNIP) versus a Journal Impact Factor based on Fractional Counting of Citations, Journal of the American Society for Information Science & Technology 61(11) (2010) 2365-2396; DOI: 10.1002/asi.21371); <pdf-version>; Scopus' SNIP Indicator (Rejoinder), Journal of the American Society for Information Science & Technology (in print). Loet Leydesdorff, FÃ©lix de Moya-AnegÃ³n, and Vicente P. Guerrero-Bote, Journal Maps on the Basis of Scopus Data: A Comparison with the Journal Citation Reports of the ISI. Journal of the American Society for Information Science and Technology, 61(2) (2010) 352-369; DOI: 10.1002/asi.21250; <pdf-version>. Wilfred Dolfsma & Loet Leydesdorff, The Citation Field of Evolutionary Economics, Journal of Evolutionary Economics 20(5) (2010), 645-664..
Loet Leydesdorff & Tobias Opthof, Normalization at the field level: fractional counting of citations (Rejoinder), Journal of Informetrics 4(4) (2010) 644-646. Ismael Rafols, Alan Porter & Loet Leydesdorff, Science overlay maps: a new tool for research policy and library management, Journal of the American Society for Information Science & Technology 61(9) (2010) 1871-1887; <pdf-version> <software and manual>. Ping Zhou, Xinning Su & Loet Leydesdorff, A comparative study on communication structures of Chinese journals in the social sciences, Journal of the American Society for Information Science & Technology 61(7) 1360-1376. Interaction Information: Linear and Nonlinear Interpretations, Intern. Journal of General Systems 38(6) (2009) 681-685. Diana Lucio-Arias & Loet Leydesdorff, An Indicator of Research Front Activity: Measuring Intellectual Organization as Uncertainty Reduction in Document Sets, Journal of the American Society for Information Science & Technology 60(12) (2009) 2488-2498; <pdf-version> <software>. Ricardo Arencibia-Jorge, Loet Leydesdorff , Zaida Chinchilla-RodrÃ­guez, Ronald Rousseau, and Soren W. Paris, Retrieval of very large numbers of items in the Web of Science: an exercise to develop accurate search strategies. El Profesional de la InformaciÃ³n 18(5) (2009) 555-559. Steven Bensman & Loet Leydesdorff, Definition and Identification of Journals as Bibliographic and Subject Entities: Librarianship vs. ISI Journal Citation Reports (JCR) Methods and Their Effect on Citation Measures, Journal of the American Society for Information Science and Technology 60(6) (2009) 1097-1117. Ping Zhou & Loet Leydesdorff, Chemistry in China -- a bibliometric view, Chemistry Today 27(6) (2009) 18-22. Loet Leydesdorff & Wilfred Dolfsma, Van onderzoeksinput naar -output, Economisch Statistische Berichten ESB 94(4564), 10 juli 2009, pp. 426-427. Wilfred Dolfsma & Loet Leydesdorff, Economie en bedrijfskunde evalueren, Economisch Statistische Berichten ESB 94(4559), 1 mei 2009, pp. 280-282. Loet Leydesdorff, Thomas Schank, Andrea Scharnhorst, & Wouter De Nooy, Animating the development of Social Networks over time using a dynamic extension of multidimensional scaling. El Profesional de la InformaciÃ³n 17(6) (2008) 611-626. Measuring Research Output with Science & Technology Indicators, Scirus Topics Page, June 4, 2008. 5 Questions concerning Bibliometrics, Library Connect Newsletter, 6(4) (2008), pp. 8-9. Loet Leydesdorff, Robert L. Goldstone, & Thomas Schank, Betweenness Centrality and the Interdisciplinarity of Cognitive Science, at the webpage of Cognitive Science: A Multidisicplinary Journal, <animation>. Wilfred Dolfsma & Loet Leydesdorff, â€œMedium-techâ€� industries may be of greater importance to a local economy than â€œHigh-techâ€� firms: New methods for measuring the knowledge base of an economic system, Medical Hypotheses, 71(3) (2008) 330-334; <pdf-version>. Zhou, Ping & Loet Leydesdorff, China Ranks Second in Scientific Publications since 2006, ISSI Newletter, Nr. 13, March 2008, pp. 7-9. Zhou, Ping & Loet Leydesdorff, A Comparative Analysis of Chinese and International Journal-Journal Relations, in: Greater China's Quest for Innovation, in: Henry Rowen, Marguerite Gong Hancock, and William Miller (Eds. ), Stanford, CA: Shorenstein Asian Pacific Center, Brookings Institution Press, 2008, pp. 269-279. 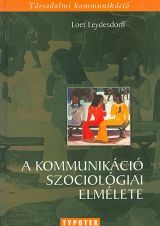 A kommunikÃ¡ciÃ³ szociolÃ³giai elmÃ©lete: TÃ¡rsadalmi kommunikÃ¡ciÃ³ sorozat (translated by Jakab AndrÃ¡s). Budapest: Typotext, 2007. ISBN: 963 9548 54 5. Include Citations When Ranking Institutions and Scholars, Communications of the ACM, 50 (9), 14, 2007. The Generation and Communication of Meaning in Social Systems, Visualizing Network Dynamics Competition, At NetSci07, New York Hall of Science, Queens, NY, May 20th-25th, 2007.
â€žWÃ¤hrend auf hoher See ein Sturm tobt...â€œ: Innovationssysteme, regionale Entwicklung und wissensbasierte Ã–konomie aus der Perspektive des Triple-Helix-Modells. In: Hanno Pahl und Lars Meier (Hrsg. ), Kognitiver Kapitalismus. Marburg: Metropolis Verlag, pp. 163-193. Should Co-occurrence Data be Normalized? A Rejoinder to: Waltman, L., Van Eck, N. J. (2007). Some comments on the question whether co-occurrence data should be normalized. Journal of the American Society for Information Science and Technology 58(14), 2411-2413, 2007. Diana Lucio-Arias and Loet Leydesdorff, Knowledge Emergence in Scientific Communication: From â€œFullerenesâ€� to â€œNanotubes", Scientometrics, 70(3), 603-632, 2007. Peter van den Besselaar & Loet Leydesdorff, Past Performance as Predictor of Successful Grant Applications: A Case Study. The Hague: Rathenau Institute, SciSA Report 0706. S&T Publication Rates: the bigger picture, SciDev.Net, 20 December 2007. Kostoff, R. N., del Rio, J. A., Cortes, H. D., Smith, C., Smith, A., Wagner, C., Leydesdorff, L., Karypis, G., Malpohl, G., & Tshiteya, R. (2007). Clustering methodologies for identifying country core competencies. Journal of Information Science, 33(1), 21-40. Top-down Decomposition of the Journal Citation Report of the Social Science Citation Index: Graph- and factor-analytical approaches. In: T. Braun (ed. ), The Impact Factors of Scientific and Scholarly Journals. Its Use and Misuse. Budapest: AkadÃ©miai KiadÃ³, 2007, pp. 127-148. A kommunikÃ¡ciÃ³ szociolÃ³giai elmÃ©lete: TÃ¡rsadalmi kommunikÃ¡ciÃ³ sorozat (transl. Jakab AndrÃ¡s). Budapest: Typotext, 2006. 250 pp. ISBN: 963 9548 54 5. The Knowledge-Based Economy and the Triple Helix Model. In: Wilfred Dolfsma & Luc Soete (Eds. ), Understanding the Dynamics of a Knowledge Economy, Cheltenham: Edward Elgar, 2006, pp. 42-76. Caroline Wagner & Loet Leydesdorff, Measuring the globalization of knowledge networks, Paper presented at â€œBlue Sky II 2006:â€� What Indicators for Science, Technology and Innovation Policies in the 21st Century. Paris: OECD; at http://www.oecd.org/document/24/0,2340,en_2649_34451_37083800_1_1_1_1,00.html.